Check this page to see if there are some suggestions for adding to Gamehack tutorials. 1 How do I set Cheat Engine 5.5 to my game? 2 How do I use my Cheat Engine? 3 Where do I find tutorials for hacking? How do I set Cheat Engine 5.5 to my game? First of all, click the nice computer button in the left top corner of Cheat Engine. When you clicked this button you can select a process. Look for your game in the list. If the name is not in there, try looking for game.exe. When you selected your game successfully, "No Process Selected" in the middle changes to your game process. How do I use my Cheat Engine? Here you can see the top half of Cheat Engine. I will now tell you what most of it is for. 1. Here you enter the value you want to search for. You can search for anything, like health and score. 2. Scan values. You can search for different kinds of values here, such as Exact Value, Smaller or Bigger than, Value Between, and Unknown Initial value. The exact value gives you the option to find exactly what you enter. Smaller and bigger than searches for smaller or bigger numbers, so not the entered value included. Unknown initial value is if you don't know what it's yet but you do know it's there. If it's the second search, you can select more. On the second search, you can search for increased or decreased value, for if the value has decreased or increased. Another one is changed value, for if the value has changed, but you don't know what it is. Unchanged value is for if the value is the same as the previous scan. And last, the search for if it's the same as the first scan. Which is quite obvious of what it does. 3. Here you can search for binary, (Single, 2, 4, 8) bytes, binary, float, double, Text, and Array of Bytes. 4. The settings. They actually do exactly as they state they do. 5. The place where the search results will appear. 6. Speedhack, this hack is used to make your game go faster or slower. 7. The search buttons. The buttons will change according to your search numbers. More on memory scanning and some of these functions can be found at Memory Scanning. Where do I find tutorials for hacking? 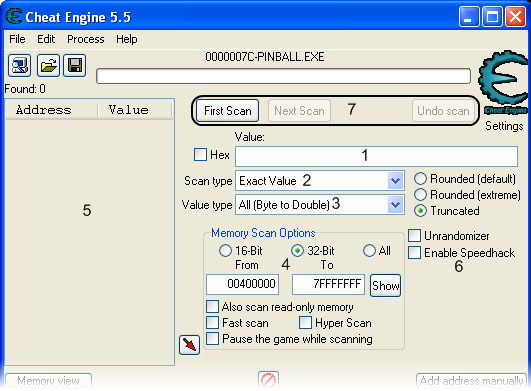 We have a section on the forum for hacking with Cheat Engine. You can find that here. - Invulnerability by unable to lose health. - Invulnerability by being unable to die. - Invulnerability by being unable to be hit. x0r's tutorial on how to find GodMode. Another method of godmode that works in a few games when they use floating point values, is setting the health to such a high value it turns to INF+ , this means infinite and normal increase and decrease won't effect if anymore. Note: This doesn't work in all games or you'll get bad graphical glitches like healthbars going over the whole screen.